As of fall 2014 show is no longer playing in Branson, it is unknown when or if they will return. The P Nutt and Ponytail Show is packed with high energy fun, a variety of music and plenty of comedy from P Nutt, Ponytail and Girl. The George Brothers have a long history of top notch entertainment. 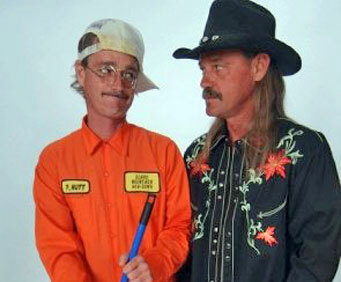 Two decades of full house performances in their Eureka Springs theater and National tours promoting the release of their new album, have increased demand for their lovable characters, P. Nutt and Ponytail. Their performance has been featured on Whoopi Goldberg's radio show, and they have been nominated for 'Best New Band of the Year' and 'Band of the Year.' 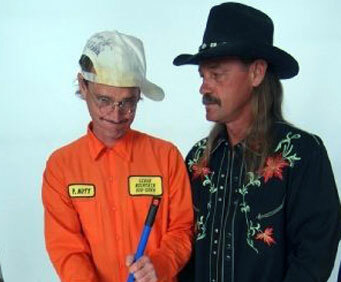 Their original music has been on three Texas music charts, two country music charts and one international music chart. Audiences love the down to earth interaction of their performances, hilarious and clean comedy, plus talented musical performances of country old and new, gospel music and their original tunes. This show is a good time enjoyed by guests of all ages. 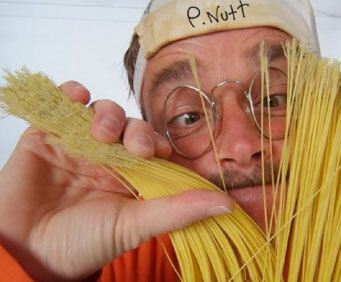 P. Nutt, Ponytail and Girl truly love entertaining, and it shows in each and every performance.